Relax with room for three in this relaxed vintage sofa. With its modern details like two back pillows with Paris script, square tapered feet, and track arms that are rounded on one side, this piece brings a spark of style to your living space. 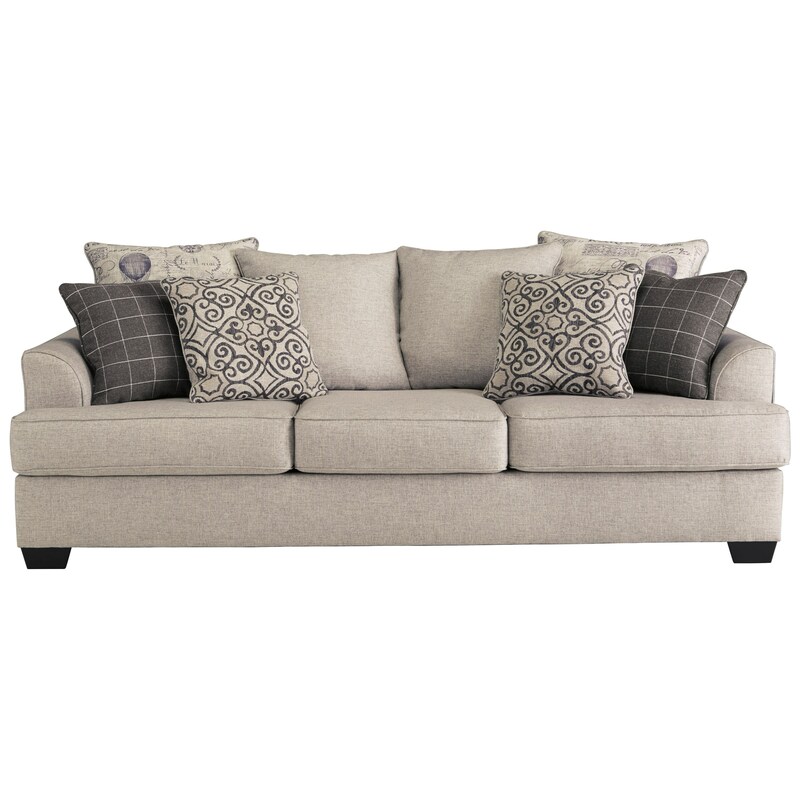 The linen-like body fabric, loose back cushions, and throw pillows keep this sofa comfy too, giving you the perfect place to sit back and unwind or share with friends and family. The Velletri Relaxed Vintage Sofa with 4 Decorative Pillows by Signature Design by Ashley at Michael's Furniture Warehouse in the San Fernando & Los Angeles area. Product availability may vary. Contact us for the most current availability on this product. Gift your home with some warm, contemporary charm thanks to this collection of living room furniture. The track arms that are rounded on one side, back pillows with Paris script, and tapered square feet of these seating pieces gives them a modern feel, while the loose back cushions, linen-like body fabric, and throw pillows keep their designs comfortable and welcoming. The Velletri collection is a great option if you are looking for Relaxed Vintage Contemporary furniture in the San Fernando & Los Angeles area. Browse other items in the Velletri collection from Michael's Furniture Warehouse in the San Fernando & Los Angeles area.